WASHINGTON – Arizona’s two senators took President Donald Trump to task in separate forums Wednesday, saying his attacks on the press and “fake news” claims embolden dictators to crack down on news media abroad and endanger democracy at home. The rebukes by Republican Sens. John McCain and Jeff Flake came the same day that the president released the “Fake News Awards” to reporters and media outlets he calls dishonest. A White House spokeswoman dismissed Flake’s comments Wednesday as “unfortunate” and a bid for attention. Reaction in Arizona ranged from praise for the senators’ “highest integrity” to charges that the two are out of touch with voters and should instead be defending a president who is finally speaking truth about news organizations. 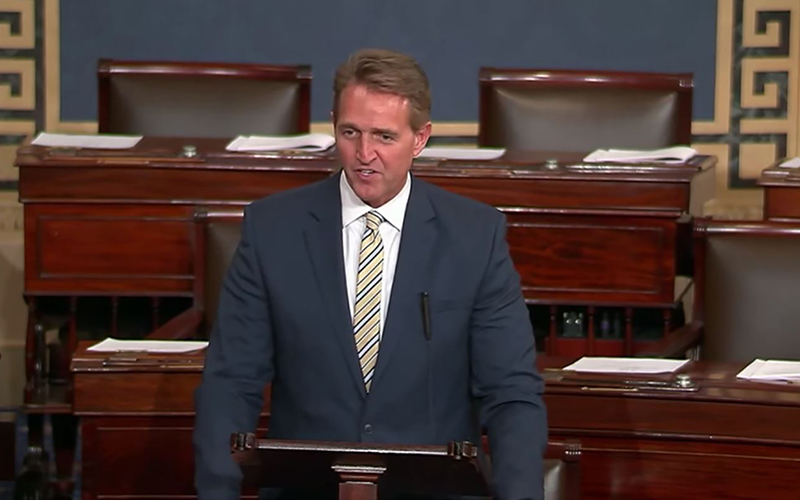 Flake took to the Senate floor later Wednesday morning for an impassioned 14-minute speech in which he compared Trump’s characterization of the media as an enemy of the people to language used decades ago by Soviet dictator Josef Stalin. Flake said before his speech that he did not know McCain had written his piece chastising the president, but he echoed many of McCain’s points about threats to free press. He said he decided to give the speech Wednesday because “words have consequences” and that the “fake news mantra” repeated by the president is being used by dictators to arrest journalists around the world. Courtney Radsch, advocacy director for the Committee to Protect Journalists, said arrests of journalists around the world grew over the previous year, with the president’s rhetoric giving cover to a more than doubling of journalists arrested on fake news charges. The committee’s website said 262 journalists were in prison worldwide in 2017, up from 259 in 2016 and 199 in 2015. Although many arrests would have happened anyway – “China doesn’t need Trump” to arrest journalists, Radsch said – the debate has definitely shifted under this administration. During a briefing Wednesday, White House spokeswoman Sarah Huckabee Sanders said she had not read all of McCain’s piece, but she suggested that Flake’s speech was motivated not by any principles but by his low poll numbers. Flake is not running for re-election in 2018. A Morning Consult poll in October said Flake and McCain were the second- and third-least popular senators in their home states, respectively, trailing only Senate Majority Leader Mitch McConnell of Kentucky. But neither McCain, who has a deadly form of brain cancer, nor Flake has anything to lose by criticizing the president. David Wells, an Arizona State University political science professor, criticized the White House response.